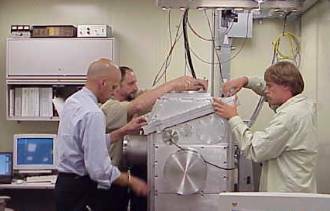 WHAT: Over the past three years a qualitatively new design of scanning transmission X-ray microscope has been conceived, built and commissioned at the Advanced Light Source. A dramatic improvement in performance has been achieved by introducing laser interferometry to control the relative spacing of microscope elements in order to achieve a mechanical precision consistent with the optical resolution, currently about 35 nm. The interferometer based system is a great advance over previous systems (old BL7.0 STXM at ALS; NSLS, X1a, Stony Brook). 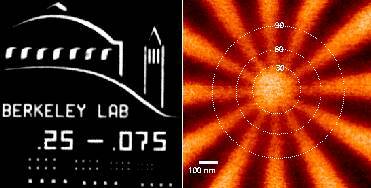 In the latter, one could image at a fixed photon energy with a spatial resolution close to the diffraction limited zone plate performance, but the spatial resolution was effectively degraded for chemical analysis applications because it was not possible to change photon energy while maintaining the focused X-ray spot on the same place on a sample, or to image at successive energies over the same x-y frame. The reason is the strongly chromatic nature of zone plates. Over a typical C 1s NEXAFS scan from 280 to 310 eV the focal length changes by up to 300 mm, requiring displacement of the zone plate along the X-ray beam by this amount while preserving the lateral position of the zone plate relative to the sample. Mechanical systems to achieve linearity of 1 in 104, with adjustment of the motion axis to the X-ray axis to a similar precision are exceptional, and indeed, the experience at both the ALS and NSLS microscopes has been that spatial resolution in point spectral mode is rarely better than 200 nm and that one needs to use software to correct for image-to-image misalignment, with concomitant residual resolution degradation. The solution that has been developed at the ALS 5.3.2 STXM is to introduce a 2-d laser interferometer which is used as part of the feedback control loop for the fast piezo stage used to position and scan the sample when making images. This system provides stability of better than 10 nm with response times up to 100 Hz and thus it not only eliminates energy-to-energy image position errors, but also helps to desensitize the microscope to vibrational or other environmental noise. With this mechanical/optical/control system, accompanied by advanced control and acquisition software, the 5.3.2 STXM is able to achieve diffraction limited spatial resolution. Fig. 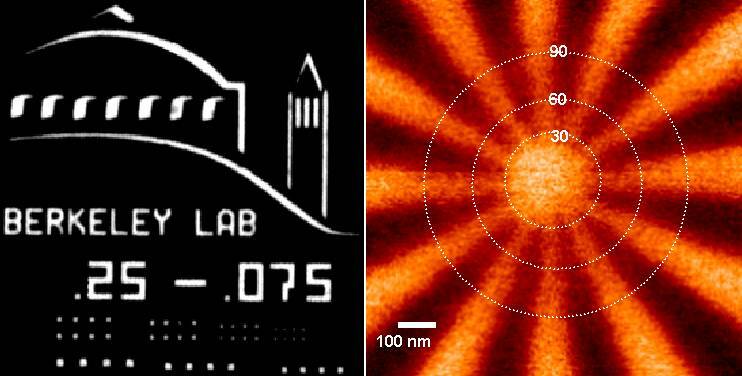 1 shows images of Au test patterns in which periodic features with a half period of 30 nm could be observed with a zone plate that has a theoretical Rayleigh resolution of 45 nm. More significantly for analytical applications, the interferometry allows the 5.3.2 microscope to retain image registry at all photon energies. As an example of the level of positional stability achieved with the interferometry system, Fig. 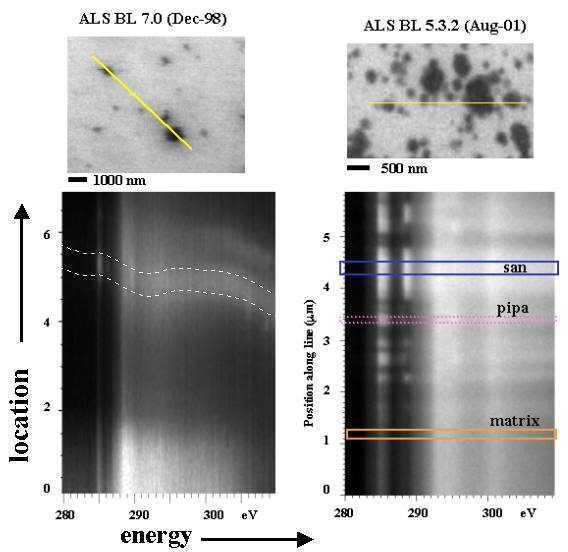 2 compares linescan spectral images acquired at BL 5.3.2 on a polyurethane sample containing nanoscale filler particles (courtesy Ed Rightor, Dow Chemical) with a data set on a similar sample recorded over a similar spatial and photon energy range, acquired witha STXM without interferometric position control (the old ALS beamline 7.0 STXM). The 'image' is a plot of position along the line indicated in the image versus photon energy. Horizontal edges on the contrast features indicate exactly the same line is traced at each photon energy. Clearly the ability to determine the NEXAFS spectra at high spatial resolution is greatly enhanced by the improved performance of the 5.3.2 STXM.